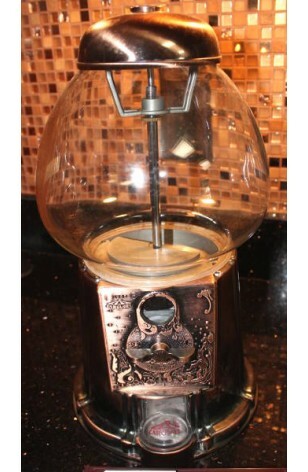 Vintage - 1985 Limited Edition, Copper King Carousel Gumball Machine, 15 Inches Tall. This very nice Limited Edition Carousel Copper King Gumball Machine, has a Glass Globe which holds (5) pounds of Gumballs, or other Candies. The Body of the Machine is Coated Metal, so should not Tarnish or Rust, accepts all coins. A Stand can still be purchased from the Manufacture, if desired. In great working condition.